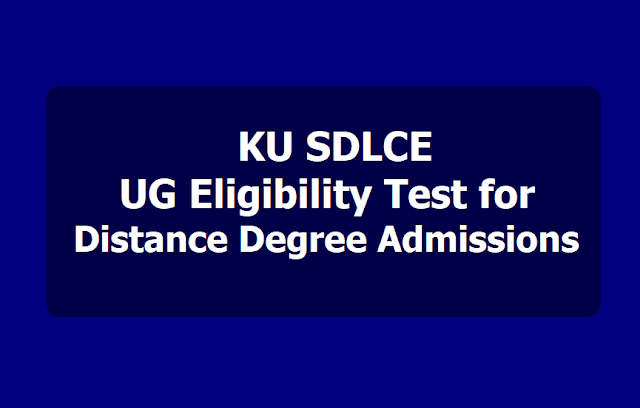 KU SDLCE UG BA, BCom Eligibility Test 2019 Notification/KU SDLCE UG Eligibility Test 2019 for KU Distance Degree admissions, KU Open Degree admissions, KU Distance Degree Admission Test, KU Open Degree Entrance Test: KAKATIYA UNIVERSITY, SDLCE, Warangal has issued Under Graduate Eligibility Test 2019 Notification. School of Distance Learning and Continuing Education, Kakatiya University invites applications from the eligible candidates for admission into BA /B.Com / BBM / B.Sc Courses into their study centers for the academic year 2019-2020. Last date to apply is 04.02.2019. SDLCE, Kakatiya University invites applications for BA/ B.Com. (General/ Computers) Eligibility Test 2019. Candidates do not possess intermediate or its equivalent qualification are eligible to appear for this SDLCE UG Eligibility Test 2019 for seeking admission into First year of the BA /B.Com / BBM / B.Sc Courses for the academic year 2019-2020. Candidates should have completed 18 years of age as on 30.06.2019. Candidates who do not complete 18 years by 30th June, 2019 are not eligible to appear for the SDLCE UG Eligibility Test 2019.
half-an-hour after the given time will not be admitted. Filled in application form with required xerox certificates and along with a demand draft for Rs.200/- in favor of "Registrar SDLCE, Kakatiya University, Warangal" payable at warangal drawn on any SBH/SBI/Andhra Bank should submit to their study centers and candidates can obtain their Hall Tickets from their study centres. 2. Last date for submission of application: 02-02-2019. Tags: KU SDLCE Eligibility Test 2019 Notification, SDLCE Eligibility Test for Admission into BA /B.Com / BBM / B.Sc Courses, SDLCE UG Eligibility Test 2019 Notification, SDLCE BA /BCom/BBM / BSc Courses Eligibility Test 2019 Notification, SDLCE Kakatiya University BA BCom (Gen./Comp.) Eligibility Test.